Dr Ian Johnston is an academic engineer and applied mathematician with a passion for taking science to the masses. He was scientific expert and Richard Hammond's aid on 'Battle of the Geeks' (BBC's 21st Century version of 'The Great Egg Race'), was academic consultant to "Electric Dreams" and has been academic consultant to "Bang Goes The Theory" since it started. He toured with the "Bang Goes The Theory" Roadshow in 2010 and 2011, appearing on-stage with the show's presenters and on-pavement as the irrepressible Dr Megaphone (Stand Up and Shout about Science). In 2011 he appeared with Johnny Ball and Adam Hart-Davis in a team of media scientists on "Celebrity Eggheads". He believes that engineering is about to enter its most exciting phase for years: a new scientific and industrial revolution in which humanity must learn how do everything again, but this time in a sustainable way. This breakthrough is going to take the brightest, keenest, most imaginative and creative minds for generations, and we have to start enthusing people of all ages and backgrounds now. Ian states that he doesn't just work in television for fame and world travel. If the shows persuades one more person to take up engineering and help solve the world's problems, he'll be happy. A million would be better, though. He was born and grew up in Glasgow and now lives in Galloway (south-west Scotland) with his wife Jane, son Sandy and more classic cars than he cares to contemplate, some of which work. After studying engineering science at Oxford, Ian graduated and started research on artificial knee joints. After a couple of years he ran away from academic life to enter full time training as a ballet dancer - returning to the fold a year later when money and talent ran out simultaneously. He is still an active amateur dancer and performs in any show willing to have him. Any free time left is spent sailing around the West Coast of Scotland in Jumblie, his beloved Victoria 26 sailing yacht. Since 1991 he has worked for the Open University as a Staff Tutor (lecturer) in Technology, which means that he jointly overseas academic aspects of the presentation of technology faculty courses throughout Scotland. His official research is in superconductivity, in which he has gained his doctorate. However, he finds informal research just as entertaining and rewarding: his two most famous inventions are the world's most flippable drinks mat (the Aeromat, designed in 2003) and the Technotowel (2004), a bath towel which doesn't fall off when you answer the door to the vicar after a shower. Neither of these have made it into production yet, but he remains open to offers. From November 2005 until June 2006 he was seconded to work as Director/CEO of the Active Training and Education Trust, an educational charity which runs residential holidays for children. 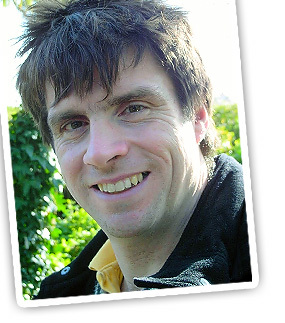 In 2006 he founded the EcoWeek Trust, which runs green-themed residential holidays for children at and with the Centre for Alternative Technology in Wales and in the Peak District.